The first full price CD I bought as was ‘Unforgettable,’ I played and sung along to it constantly! 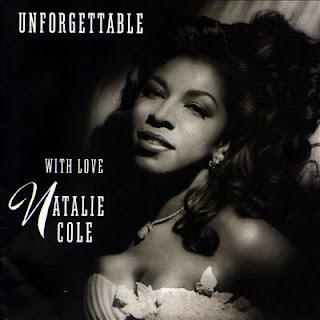 Natalie Cole has made her way through R'n B, Pop, Jazz and Classical Crossover and she was instrumental in shaping the direction my early love for Jazz took. I love her work with José Carreras, Plácido Domingo and orchestra; and the the fantastic duets with her late father, through wonders of technology. Over the last decade my strongest memory of her is her swinging away with Diana Krall to a lush big-band. Her distinct voice has throughout her career been employed with the greatest possible versatility! 25 years after its release, ‘Unforgettable’ still stands as one of the most complete and memorable jazz-albums I have ever bought. I sang her music and tried to follow her amazing phrases; the sound of the big-band played relentlessly in my head, with or without my consent—day and night, and sometimes kept me from sleeping; and needless to say, I was 12 and had a crush on her! I sometimes thought of telling her the story of my granddad’s workshop if I ever got to meet her. Sadly, I have run out of time! The beautiful Natalie Cole has left us at age 65 — early, like her father. I’ve attached a picture of the album-cover so you too can get a crush on her! I hope I get to tell her that story one day.